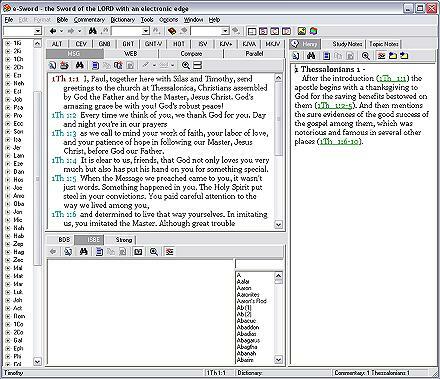 A screenshot of the free eSword Bible software for Windows. Next up in my “I’ve been meaning to blog about this for ages” series comes the excellent eSword bible software. I’ve been using eSword for a couple of years now, and it’s now at the truly holy version 7.7.7. (Stryper would be proud of them!) There is also a version available for Pocket PC (or whatever Microsoft are calling their PDA version of Windows). What I really like about eSword is its variety of Bible versions available. I regularly use The Message, Contemporary English Version (CEV) and International Standard Versions (ISV), as well as occasionally in Hebrew or Koine Greek. Sadly, the New International Version (NIV) and New Revised Standard Version (NRSV) are not available as their publishers haven’t granted eSword a licence. The user-interface is really quite simple too: Select the version you want (of those you have installed) in the central section, and in the left-hand pane select the book and chapter you want to view. It couldn’t be more simple than that. If you have any commentaries installed you can access information from those in adjacent panes; or create your own study notes. eSword also has a Compare function, showing your selected Bible verse in each version you have installed; or a Parallel function, allowing up to four versions to be viewed side-by-side. Searching for a passage is a simple case of clicking Search and telling the software what you’re looking for, and in which version. It’s certainly worth checking out. But if you want to download everything then you’ll certainly need a broadband connection as it clocks in at over 336 MB. Only a few days now until Deep Impact 2005 in Aviemore and the scene in the Saunders’ household is much the same as prior to the previous two Deep Impact weekends, in 2000 and 2002: one of controlled panic and frantic session writing. Believe it or not, I’ve never used Microsoft PowerPoint before. My old PC, a Time AMD K6/2 500MHz running Windows 98se, had a dodgy graphics card driver that would always crash whenever I ran PowerPoint. I tried to update the graphics card drivers and whenever I did the PC would refuse to boot. It did the same with the presentation software on the Lotus Smartsuite too, Freelance. And the OpenOffice.org Impress. So in the end I just gave up. My new PC, a NetHighStreet Athlon XP 2800+, doesn’t have the same problem — I would expect not with a Radeon 9800 installed. So, this evening I’ve been creating a presentation, in Powerpoint 2000, for a session I’m co-leading with Struan Gardner called “Gems among the rubbish: a guide to the web”. The focus? Web standards, Accessibility, Open Source, and Mozilla Firefox. Of course! !